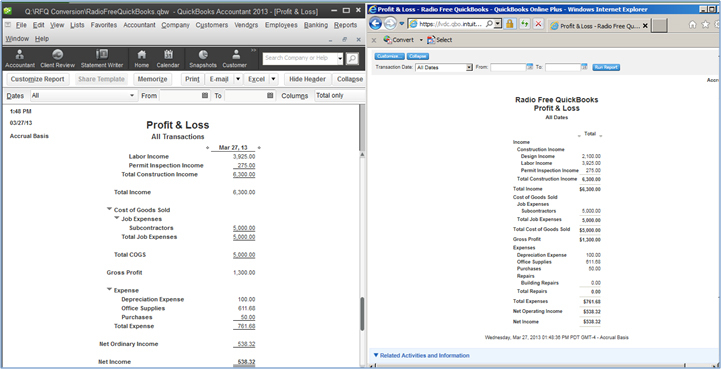 Not that I want anyone to really ever DO this, but I thought it would be a nice follow up to the QuickBooks Desktop to QuickBooks Online post from a few weeks ago. 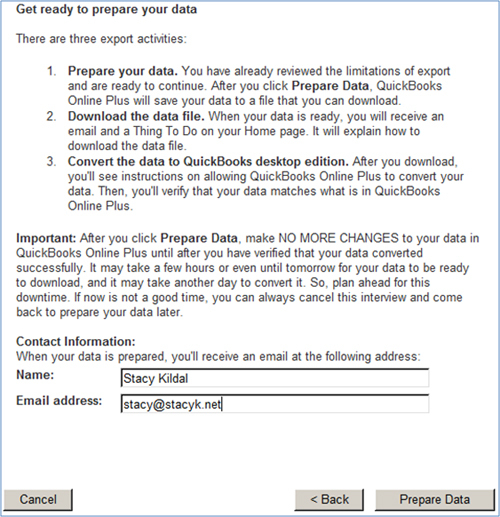 For more in depth considerations when converting, please check out the article “If You Really Must – Considerations for Converting from QuickBooks Online to Desktop” at Stacy’s Online Solutions at Sleeter.com. 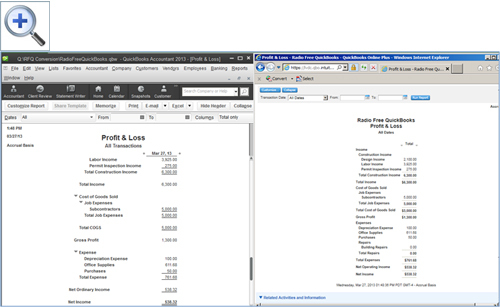 To start the conversion/export process, you first must be using Internet Explorer, and it has to be Windows. 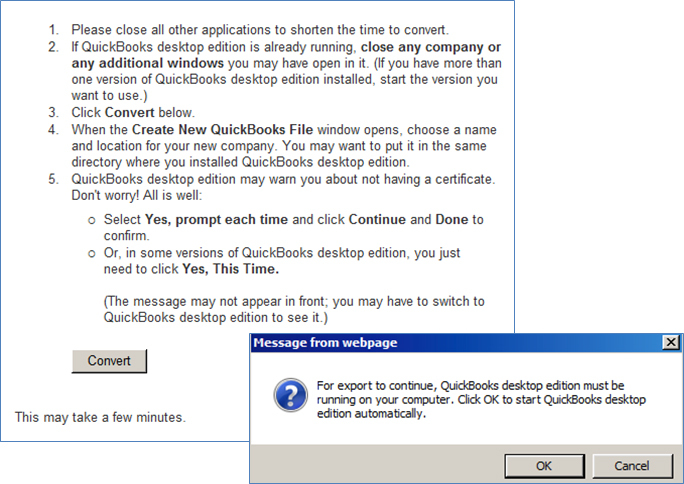 You have no idea how much this bums me out – and I think I’ve been rather vocal about it to the QBO team, bless them for putting up with me – because I converted my practice to Mac in January 2012. In order to do this, I need to either dredge up my old Windows laptop, or lock myself in my office. And I try to avoid my office as much as possible (as I write this, I’m sitting in my living room watching CSI:NY; but only because I can’t find Law & Order on ANYWHERE), as many of you may know. Another option if you’re working on a Mac, and this is what I do, is to login to IE via your hosted account. 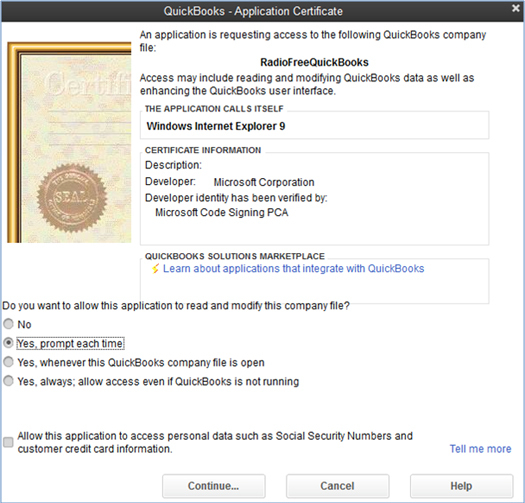 You may be prompted to install an ActiveX control – do this. You can’t complete the process without this installed. If you’re working in a hosted environment, you’ll most likely need to contact their support to get it installed. I called mine, www.UniDataIT.com and had it done in less than 10 minutes. Love those guys! Check all of those, then click the “Next” button at the bottom of the window. 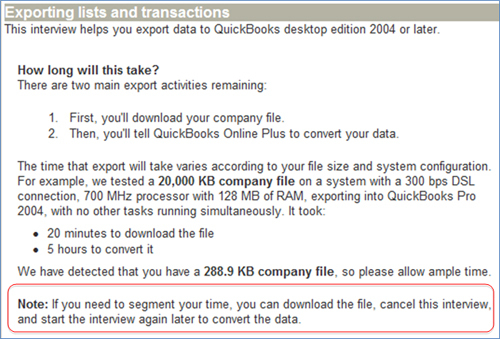 The last screen in the pop-up window Export Interview asks for your name and email address; you’ll be receiving an email at this address when your data is ready. When you see this screen, just click “OK” and wait for the email. 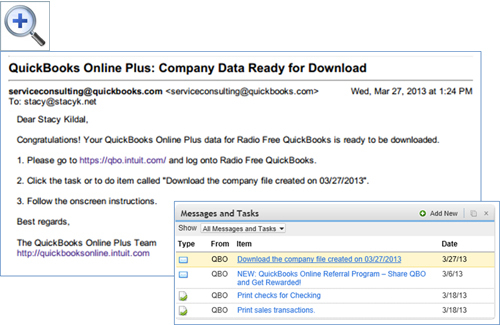 I love that they send the email AND put a “Thing To Do” on your QBO homepage. I wish every program I worked with would add a Thing To Do, and maybe post them on my bathroom mirror as sticky notes every morning. Is that maybe asking too much? Sigh. I think you’re right. 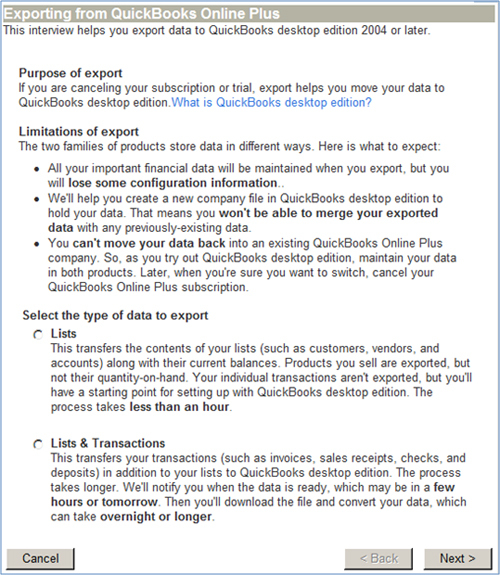 The important part at this point is to remember: anything entered into QBO will need to be RE-ENTERED after you finish the export/conversion process. The best part of this is that you don’t have to do it all at once – you can download, then come back! 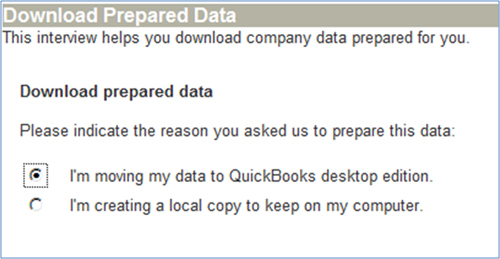 When complete, you’ll be reminded to verify your data and to cancel your QBO subscription if you won’t be needing it. You will be able to view the data for up to one year after you cancel, and you can reactivate the account at any time during this period – but you would have to manually enter any transactions entered via the desktop edition, or use tools like what BayStateConsulting.com has to offer. 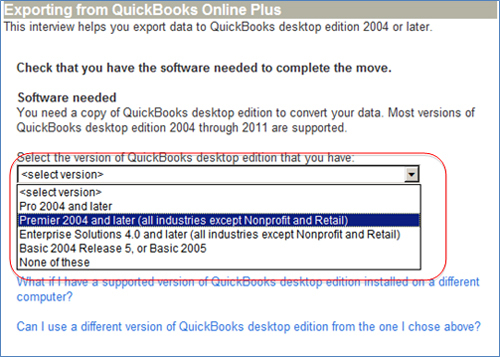 Good luck with your conversion, and I’d like to make one more suggestion before abandoning QBO. Evaluate the pain point involved in the decision to convert. Many times this can be solved by a simple work around (ie: progress invoicing) or by utilizing an add on (ie: Inventory Assemblies). Stacy Kildal is an Advanced Certified QuickBooks ProAdvisor, Certified Enterprise Solutions ProAdvisor, Sleeter Group Certified Consultant, a nationally recognized member of the Intuit Trainer and Writer Network, and cohost of RadioFree QuickBooks. She is the owner/operator of Kildal Services LLC, providing accounting and technology consulting, QuickBooks conversions, bookkeeping services, payroll setup and processing, Intuit merchant services and customized training. Thanks Stacy. 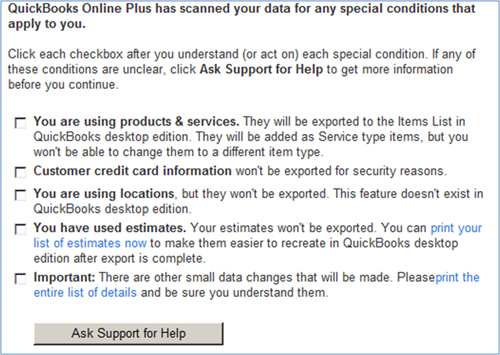 This is very similar to what's available on the Intuit support site. However, I am on Windows 8 and IE10 and come up to the Convert step. 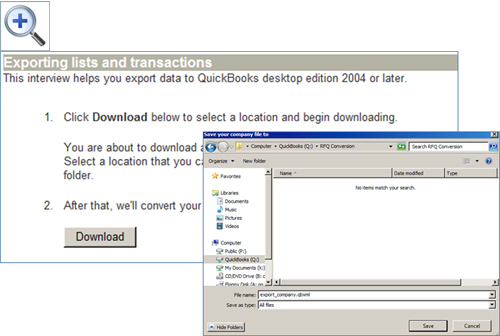 But after hitting Convert - I cannot get the "Create New Quickbooks File" window. Know of anyway to get that working, or a workaround? Really nice visual walk through Stacy, thanks!I just suffered through the same pain as Abhay! You can hit F12 in IE10 to bring up the developer toolbox at the bottom of the screen. On there you will see an item listed: Browser Mode: IE10 you must change this to IE10 Compatibility Mode for this to all work. Good luck, took me about 10 tries altogether, but finally worked through all the IE10/Win8 related headaches, this being the last one. 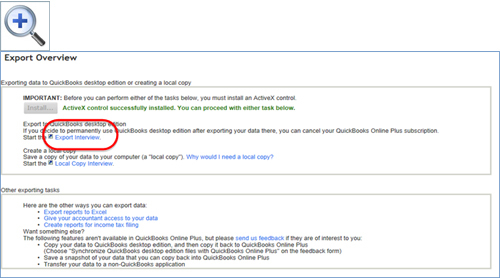 Your instructions did not work just like the instructions provided by QuickBooks Online. 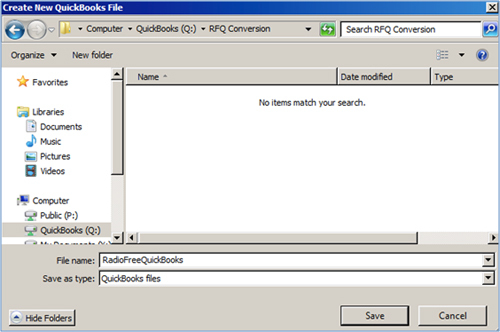 I tried to convert my QBOnline file to QB Pro 2007. Had no trouble downloading the file. 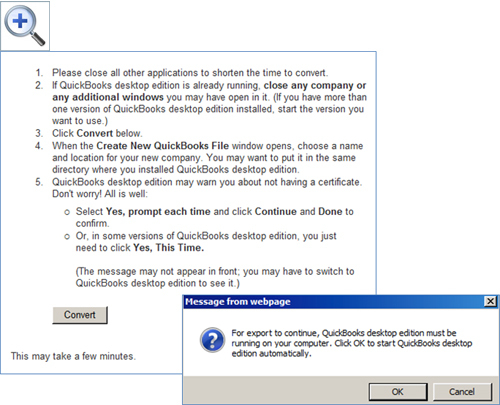 Followed the instructions but the window never opens and asks me where to save the new QBW file or what to name it. Using IE10 on a Windows 7 machine in 32 bit. I do not have a pop-up blocker on and I have my QB Pro in single user mode. Any assistance would be greatly appreciated. For us the number one reason for converting is the cost. With the online version you re-buy the software every year. It's better for us to just pay once for the desktop version. I tried to do this as you recommended. 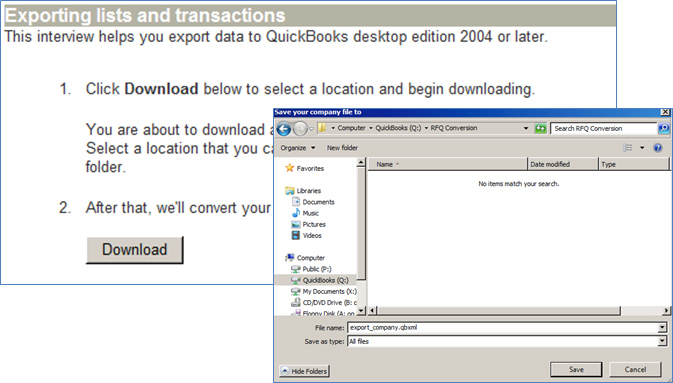 However, where I'm getting caught up is that I had to be in a windows environment (on my son's computer) to export, but then when I do the convert step it wants me to have Quickbooks Desktop open. However, I need to do that step on my Mac since I bought the Mac version. Any advice. I appreciate this detailed outline; however, if one step is missing at the beginning the whole thread is mute. 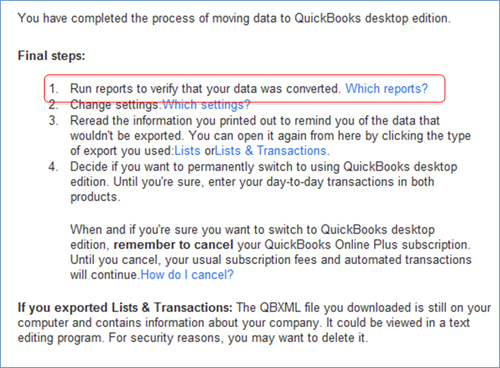 You lost me with ..."Now you have to choose to what version of QuickBooks you’ll be exporting..." QBO doesn't offer that. It goes straight into Request your Data box after chosing All transactions. I'm stuck. 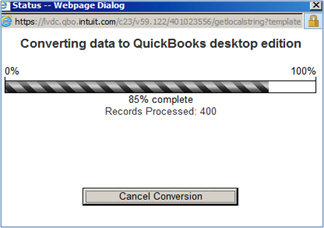 Just once, seriously, just once, I'd like to have a descent (not even good) experience with QBO. Hello Steve Schipper. Did you ever get an answer to your question? i have a similar problem. I am stuck at step 1. 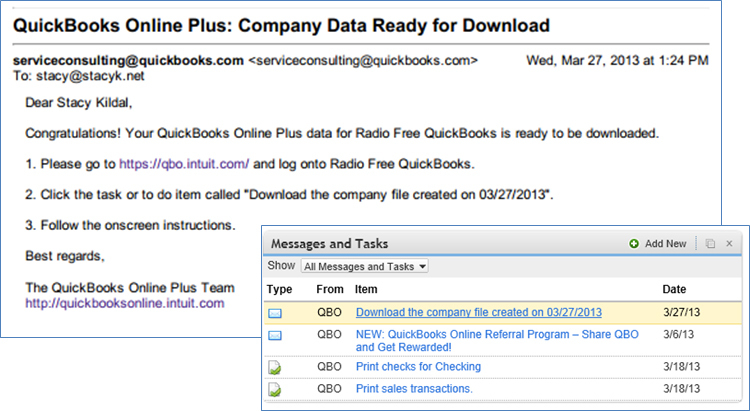 I don't have this 'company tab' on my QBO. Please help ?